Race fourteen of the PCCCT season, the Burnie Trophy House/Troy Atkins Accounting twenty five kilometre “Ironman/woman Classic” at Forth, was a triumph for one of the pre-race favourites, Devonport runner, Greg Smith. However he needed to pull out every bit of his energy and resolve to overtake the other favourite, the gallant Rick Ferguson, which he did with a couple of hundred metres to run. Ferguson, knowing Smith was in great form and loved this course, went out very hard early in the race and the effort told at the end as he was narrowly defeated. After twenty five kilometres, the margin was only fifty four seconds. This was Smith’s third win in the event. 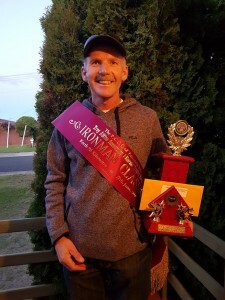 He prefers the longer races and he is also a multiple winner of the Club’s marathons. This victory was especially pleasing for him as he has had to overcome a persistent calf injury. Backmarker Bryan Tuit ran a fantastic race to finish third and also took out fastest time honours. Hayden Bishop was fourth with the first woman to finish, Amie Bramich, putting in a terrific effort to finish fifth. Other runners to catch the eye were Justin Gossage who was having his first run with the club and finished sixth just in front of the fastest woman, Ellen Elphinstone. Earlier the nominated time winners were Will van Rooyen, Lachie Riley, Emily Aichberger and Heath Bramich. Well done Greg. Such a honest runner who works hard.